So I was doing a mixtape for my friend Toby and decided, seeing as all the records conform with the Charity Shoppe Manifesto, I may as well post it up on our rather infrequently updated blog. 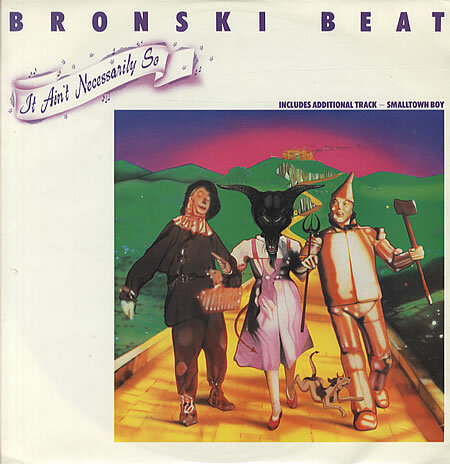 It's also a chance to post up one of my favourite record covers of all-time: Bronski Beat's, "It Ain't Necessarily So", where Dorothy's head from The Wizard of Oz is replaced with the head of the Devil. Nice. On that note, if you want to buy some golden goats skulls, you should head to East of Eden in Dalston, where they seemed to be doing a nice trade in said items. The song itself has become a bit of a Charity Shoppe classic in recent months, finishing off the night in true, "it's time to go home", fashion. For that reason, I've finished off this mix with it. It's actually a cover of a song from the Opera Porgy and Bess, where one of the characters questions stories from the Bible, so Bronski Beat's decision to release their version around Christmas 1984 attracted some controversy at the time. Uploaded by jpdc11. - See the latest featured music videos. Now I've done that, I have to post up the classic video for the B-side,"Small Town Boy", (their first single), which tells the story of a young guy being kicked out of his home for being gay. The tune is a another Charity Shoppe dancefloor favourite, with the whole of the rather long intro on the 12" version usually being played. Uploaded by Sunshinemusikbox. - Watch more music videos, in HD! The mixtape is very synthpop and kind of darkwaved-tinged and, as always with CS mixtapes, done live on a very shoddy mixer with plenty of crackling and buzzing to boot. The title refers to a rather awesome Coldcut mix from the 90's "Journeys by DJs" CD series called "70 Minutes of Madness" (re-issued in 2002). It's a mix I listened to over and over again as a teenager and appreciated it all over again when I listened to it recently. I should rather hastily point out that I am not in any way comparing this collection of songs to that classic mix. For a start, this doesn't actually include any mixing and the JDJ mix doesn't include anything remotely synthpop as far as I remember! 14. Bow Wow Wow - El Boss Dicho!